Now Available BasharTV* and Instant Download! 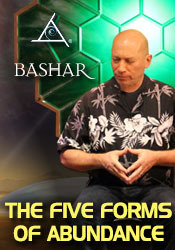 Bashar explains the main metaphysical principles that form the framework of physical reality and shares how to use them to manifest a more abundant, positive & creative life. • Is artificial intelligence dangerous? • I had an interesting parallel reality experience where I averted danger. Could you comment? • Are there 5th dimensional beings around us helping? • What do frequency vibration readings actually mean? • Which ET societies are connecting with us the most? • How do I know I'm having a belief without a thought? • How do child prodigies relate to thoughts, definitions and beliefs? • Are children born with some definitions? • Is there a 6th Law? • How can I facilitate my evolution with language? • Is there a "chess game" agreement for the dream reality? • What will happen when I ascend into the 5th Dimension? • Is the Schumann resonance assisting us into the 5th Dimension? • Which crystal would be beneficial to me? • Can negative entities attach themselves to us? • How can we travel by adjusting our frequency? • How can I use my excitement to heal physical pain? • What if one's excitement is drugs? • How does the practice of Vipassana effect our physical body? • Can you help me get rid of the high pitched ringing in my ears? • How can I use my excitement to overcome panic attacks? • How do I know if a thought is coming from my physical mind or my higher being? • How can I help my teenage children if they don’t listen to me? • Is there a benefit to contact with ET races? • Do you know everything about me? • Could you comment on my experiences after doing The Hour of Power Meditation? • How can we shift to our most preferred "now"? • Do you have any AI technology that you would like to share with us that will help us connect with our higher selves? • What past life am I connected with now? • What is my frequency state when I am detached from my negative beliefs? • Am I communicating with you on a daily basis? • Can you adjust your frequency from quasi-physical existence? • Could you comment on my first channeling experience? • Sometimes after channeling I am left with visuals that I don’t understand, can you help me make sense of them? • How can we create a plastic that will absorb radiation? • Does your society have a form of money? • How can we bring energy from other parallel existences and use it to our benefit?